The recent EVICTIONS of homeless people living in vans and caravans from Greenbank, Easton and an ENCAMPED PROTEST in July on the council’s doorstep on College Green has focused attention on BCC’s homelessness prevention and provision services. As well as its new draft policy proposal on van dwellers and rough sleeper encampments. As The BRISTOLIAN recently highlighted, a private for profit company, Social Impact Bristol Ltd is to commodify and make a profit from homeless people through a SOCIAL IMPACT BOND. So it may not entirely be a coincidence that the recently launched DRAFT POLICY ON ROUGH SLEEPER ENCAMPMENTS is proposing to wholly outsource homelessness provision to St Mungo’s. An organisation that is intimately involved with Social Impact Bristol Ltd. and will be paying interest to the ‘high net worth individuals’ that have invested in it. 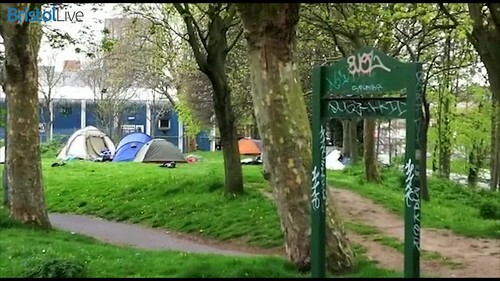 Bristol is seeing increasing numbers of people BECOMING HOMELESS, with some taking control of their own living conditions by squatting, living in vans, caravans and tents and refusing to pay exorbitant rents to landlords. Sadly far too many are falling through our social safety net and ending up on the streets. Against this backdrop, a policy proposal that would seem to originate from the DEPUTY MAYOR’S OFFICE seeks to coral all rough sleepers into a ‘pathway’ through St Mungos. Encampments, even if deemed “low impact” with no anti social behaviour complaints, are only going to be tolerated for a maximum of 3 months and then dwellers will be forced into a “pathway”. Whilst Marvin has been jetting off to Asia to seek international finance at a Green Growth seminar, there are people who are living environmentally LOW IMPACT LIFESTYLES that are going to be directly affected by the Draft Policy proposal on Rough Sleeper Encampments. A policy headed by Tom Gilchrist, BCC Gypsy and Traveller Liaison Officer, who has publicly stated he “wants to see everyone in bricks and mortar”. How does this draft policy proposal fit in with Marvin and Deputy Mayor Asher Craig’s public statements about inclusivity, sustainable living and other corporate drivel? Many homeless people refuse to engage with St Mungo’s, citing reasons of chronic drug dealing, serious substance misuse issues, violence and theft within St Mungo’s hostels. St Mungo’s own outreach workers state that they don’t have the capacity to deal with the number of homeless people, and admit that St Mungo’s hostels are DANGEROUS AND UNSAFE for those that do use them. We ask why would a draft policy proposal that comes under the remit of the Deputy Mayor be calling for all homeless people to be CORRALLED into St Mungo’s when St Mungo’s doesn’t have the capacity or the safe conditions to properly assist some of the most vulnerable people in our city? It wouldn’t have anything to do with providing a financial investment return to those high net worth individuals that have invested in Social Investment Bristol Ltd would it? This entry was posted in News and tagged Asher Craig, Bristol City Council, College Green, Deputy Mayor, Draft policy on rough sleeper encampments, Greenbank, Gypsy and Traveller Liaison, Homeless, Resonance, Social Investment Bristol Ltd, St. Mungo's, Tom Gilchrist on November 13, 2018 by thebristolblogger.